With September just around the nearest corner, I’m already dreaming of an ‘indian summer’ – anything to hold onto the feeling of summer and long days of sunshine! One place that to me evokes everything that summer is about, is Halcyon House in Cabarita Beach on Australia’s beautiful east coast. I’ve just written a piece about it on This is Glamorous so I was inspired to design a moodboard inspired by it and its richly layered interiors which were designed by the extremely talented designer Anna Spiro. There are lots of elements that you need to get right to have a really well designed room. One of my favourite parts of the process and one where you can make a big difference is in the final styling touches. A bit like choosing the right jewellery to finish an outfit beautifully, it should never be overdone, just enough to give the effect that you wish to achieve. 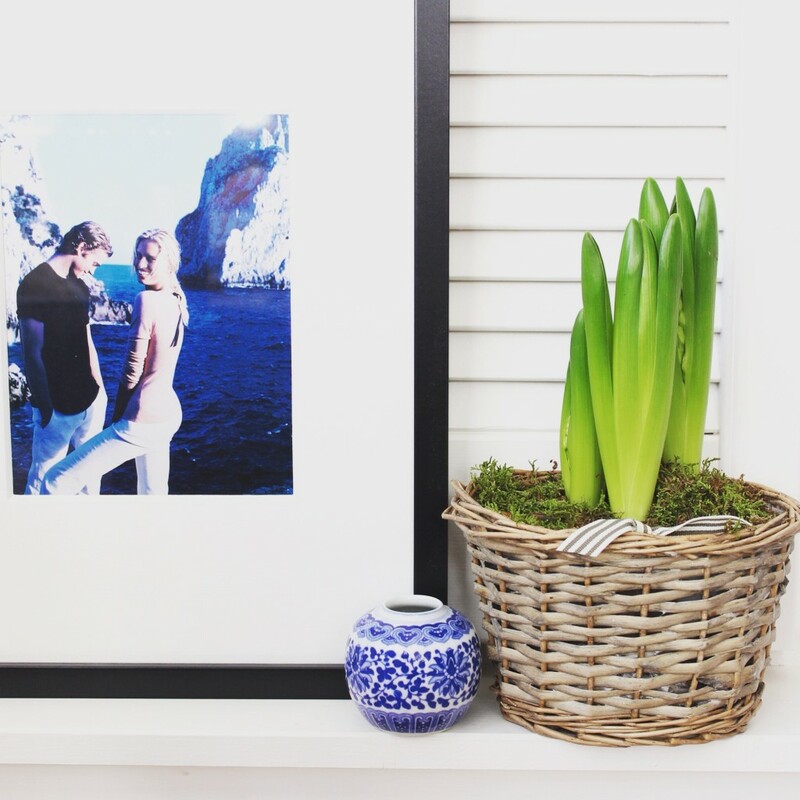 In the same way that many truly stylish women will mix items from high street stores with more expensive designer clothing, I’m a fan of mixing inexpensive finds into your home. 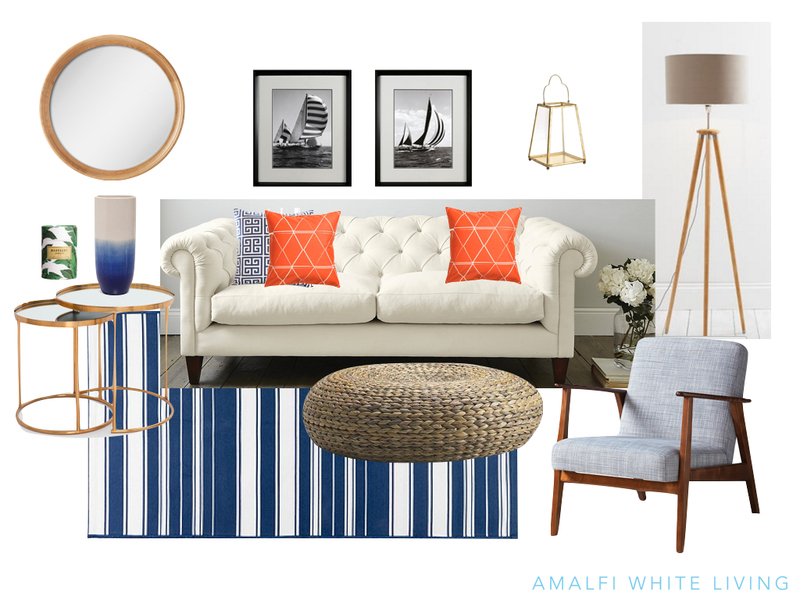 Starting with a sturdy cream linen Chesterfield sofa from The White Company, I’ve come up with a moodboard for a ‘Coastal Chic’ living room that costs less than £2430* for all the elements featured, using well designed pieces from less expensive stores such as H&M, Zara and Ikea. While I would always advise clients to invest in larger pieces of furniture, buying from the high street stores can be a great way to play with colour or try out patterns without breaking the bank. And it also goes a long way to proving a point which is dear to my heart. And that is that clever design should not be beyond anyone’s reach. I’m a firm believer that you can actually save money by working with an interior designer – not only can we share our knowledge of clever finds and secret sources but we are trained in how to pull it all together to work in your space. If this piece has inspired you and the time is right for you to get your home looking as you’ve always known it could – for less than you thought it would – then please get in touch and we can start planning your very own makeover. * The cost of £2430 covers all the items in the moodboard including the sofa. If you would like a copy of the shopping list, please email me and I’d be happy to share it with you. 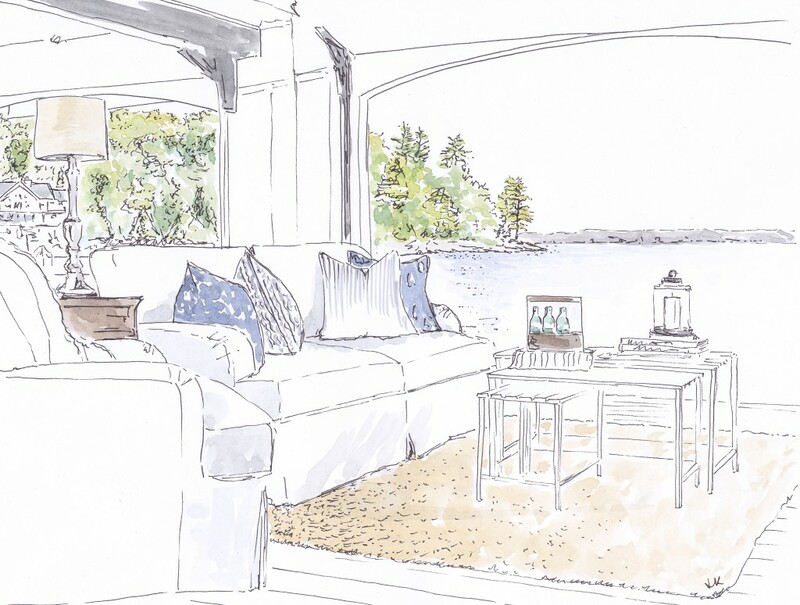 In my mind’s eye, I can already see my dream house by the sea – covered with weatherboard, a seat outside to watch the sun rise and a pretty garden with hardy plants to withstand the salty breezes. Inside there would be white-washed wooden floors, simple blinds or billowy drapes on the windows and lots of cosy places to sit. A fireplace is a must with baskets of logs nearby ready to warm up chilly days and evenings, even in summertime. 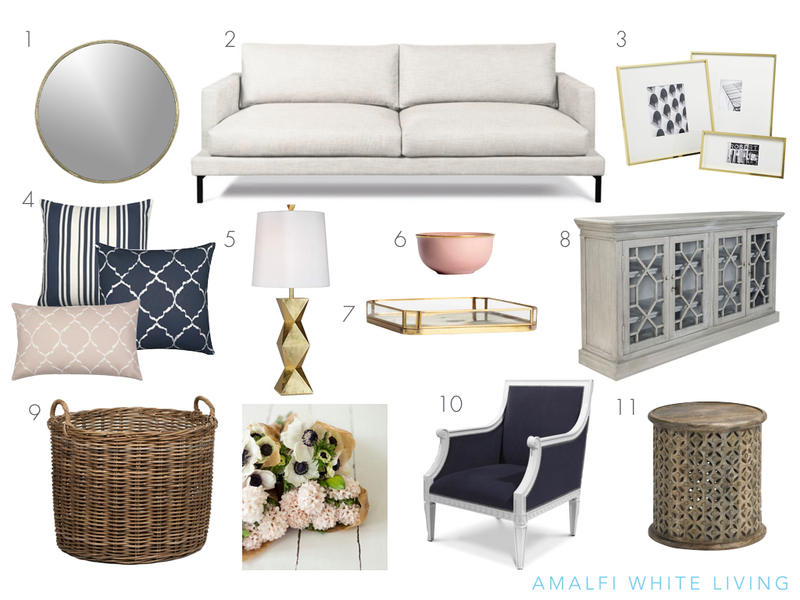 The palette would be inspired by the coast with lots of navy and white but for a pretty twist, I’d add blush pink and finally touches of brass or gold to give it that little bit of glamour that we all need. 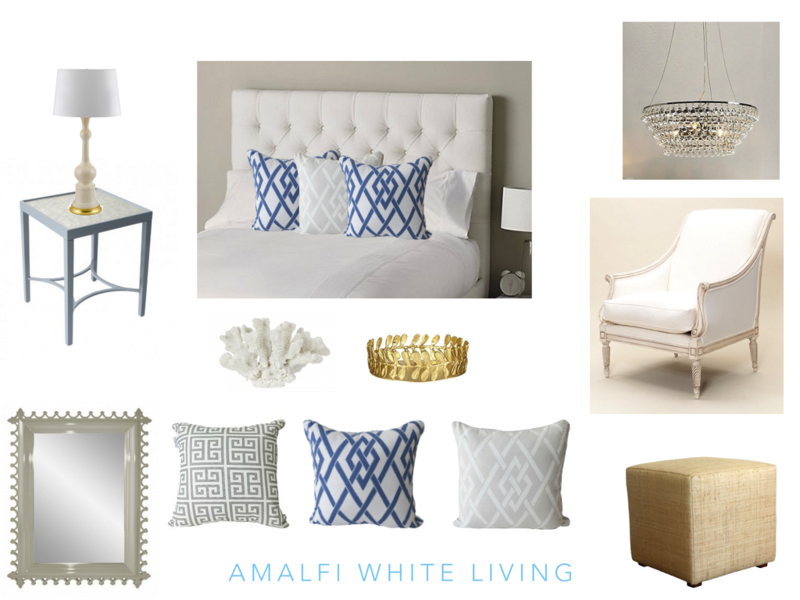 Hamptons style is very much inspired by the ocean and a Hamptons style bedroom should have a calm and soothing palette while retaining the subtle sense of glamour that this style is all about. Mix different textures like the glass lamp and glass droplet chandelier (below) with a rattan covered stool and mother of pearl topped bedside table. Then layer subtle colours that are reminiscent of the sea – blues, greys and whites – and accessorise with a statement mirror and pretty metal candle holders. 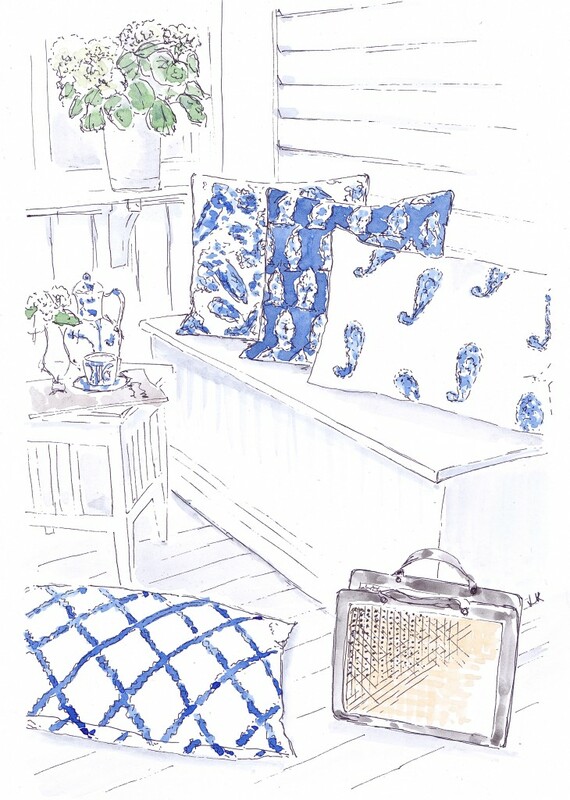 And you’ll have a soothing sanctuary which feels fresh and light with that Hamptons touch of glamour. 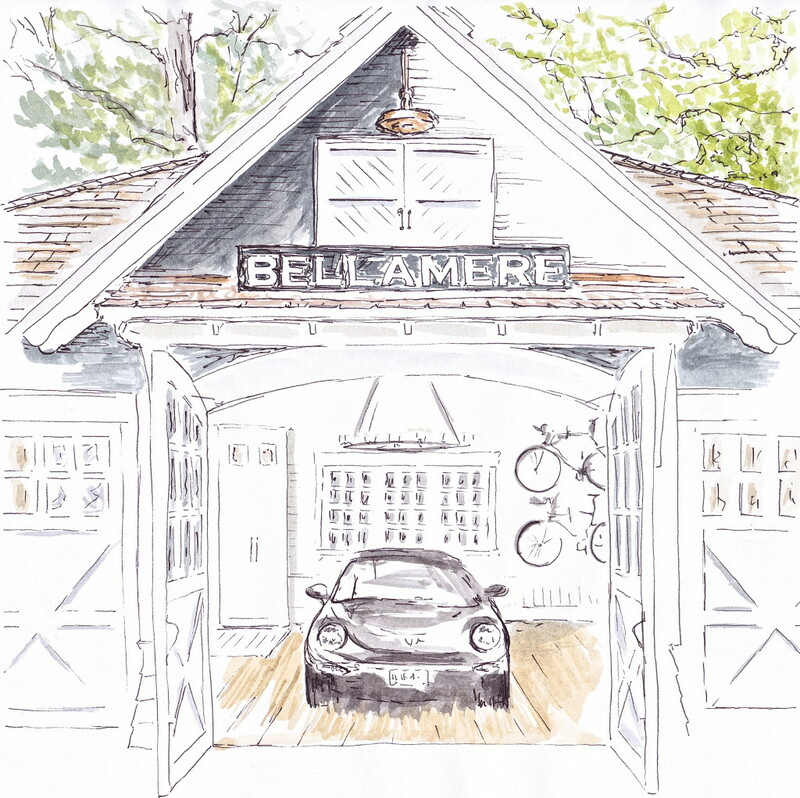 I’ve been collecting Hamptons Style images here on Pinterest for a while now so do follow me for ongoing inspiration. 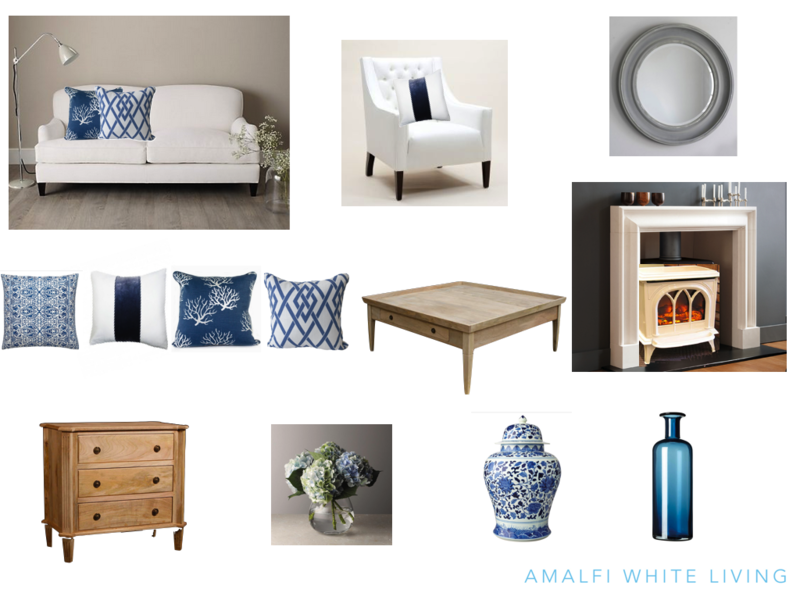 And if you’d like me to design a Hamptons style bedroom for you or you would like to source any of these items, please get in touch. This post is all about the style of summer so I hope it’s summer wherever you are – and if not, then I hope the sun is at least shining! 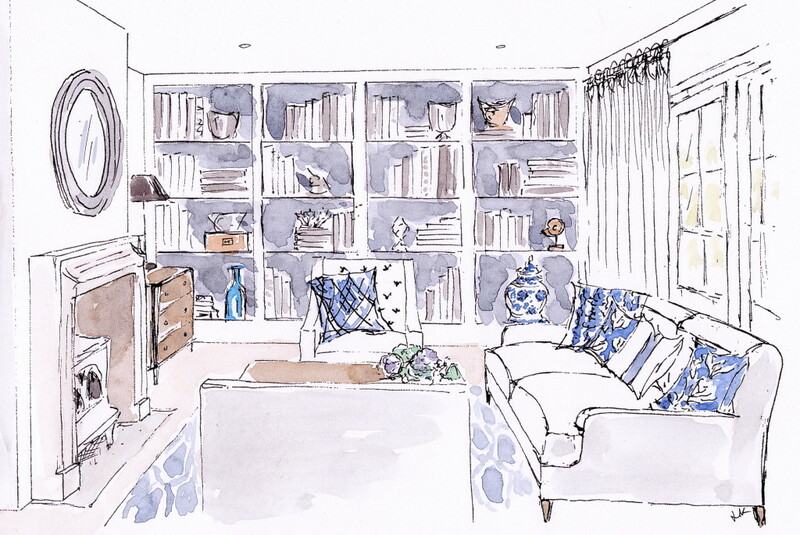 I’ve been working on this living room for which the brief was ‘warm, welcoming and elegant’. It’s a summer house for the family so it needs to be a home away from home, with all the comforts you would expect but a truly relaxed vibe. 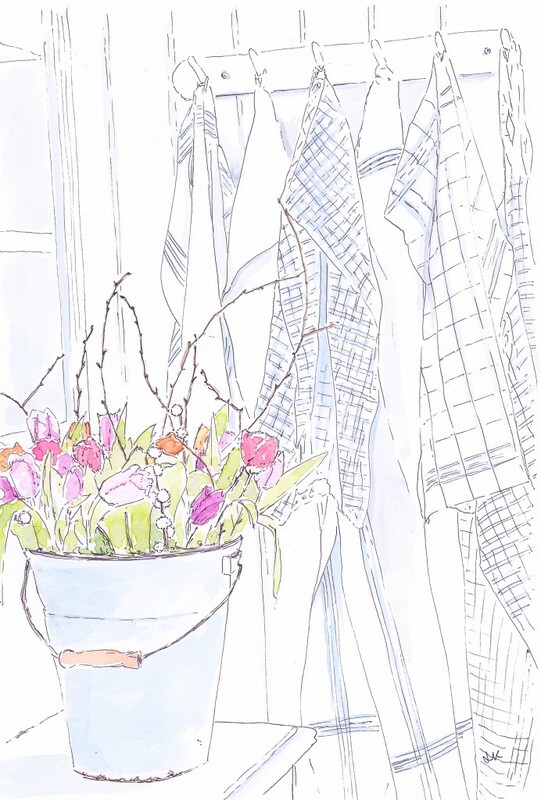 I took the cue from the fact that it’s a summer house to make it reflect this most wonderful of seasons with lots of light and pale fabrics. But you can see how it will provide a warm welcome year round with the gorgeous ivory woodburning stove surrounded by a classic limestone mantel. If you like nothing more than curling up with a good book, then the wall of shelving will surely appeal. The dark background is a great design trick to add drama and allow the items on the shelves to really stand out. 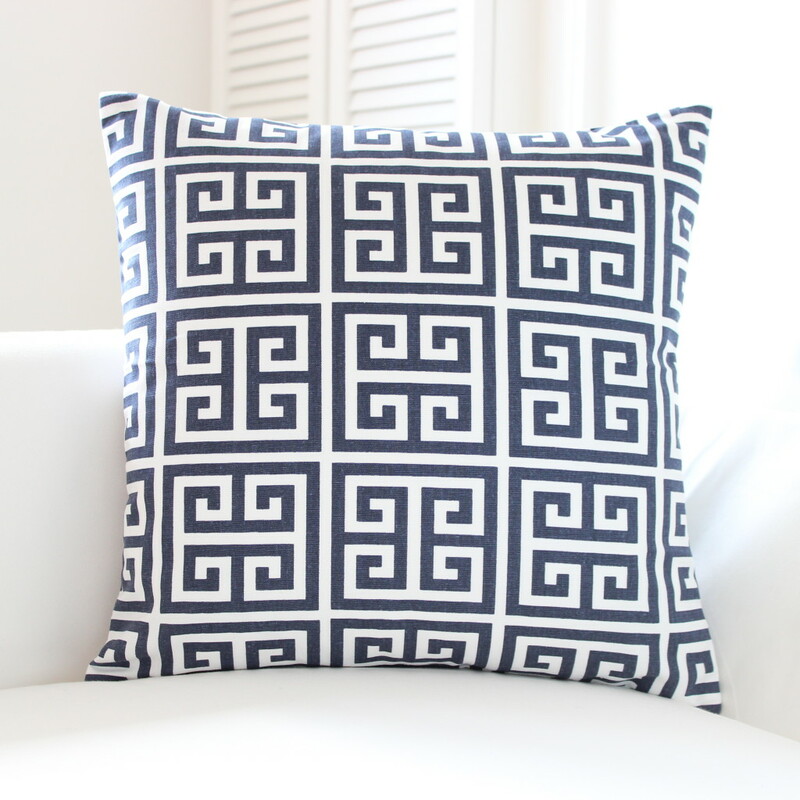 If you are a fan of blue and white, then using this colour combination in accents is a great way to make a room feel fresh and inject colour at the same time. And who can argue with a style icon like Aerin? If you’d like information on any of the items I’ve included in this living room please email me and I’ll give you all the details of where I sourced them. And if you have found this post inspiring and you would like some advice on how to inject some summer fresh ideas into your home, then please do get in touch! 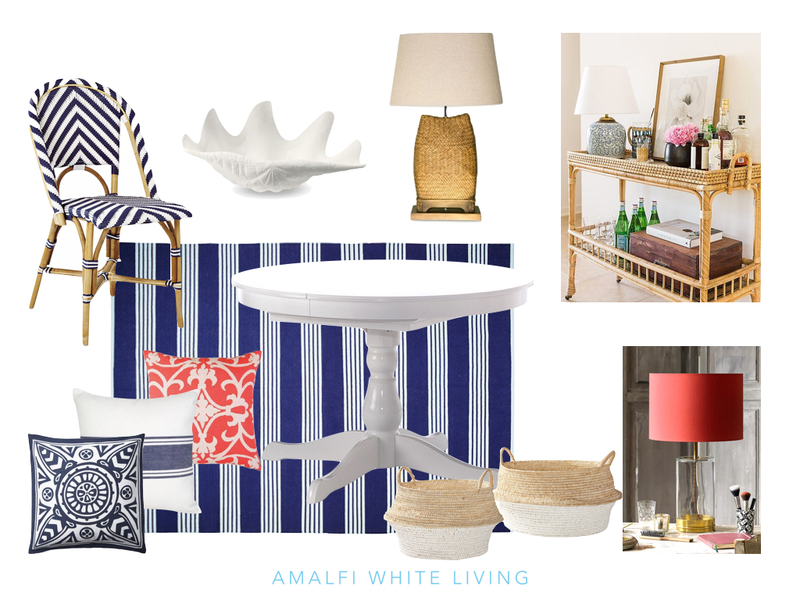 As promised in my last post, here’s a space I have designed based on the classic view of the Amalfi Coast below. While the colour palette of the image has been an obvious influence on the design, it’s also the sense of the Amalfi Coast that I also wanted to capture. I’ve chosen a very light palette against which the blue can really stand out with white walls and a white painted floor as well as a white linen banquette (treated with stain guard of course!). It’s that idea of brightness and intensity which makes this space feel summery while the slightly greyed wood of the dining table balances it out and stops it feeling too blindingly white. When I think of Italy I imagine great food and lots of time spent around the table enjoying it with family and friends. 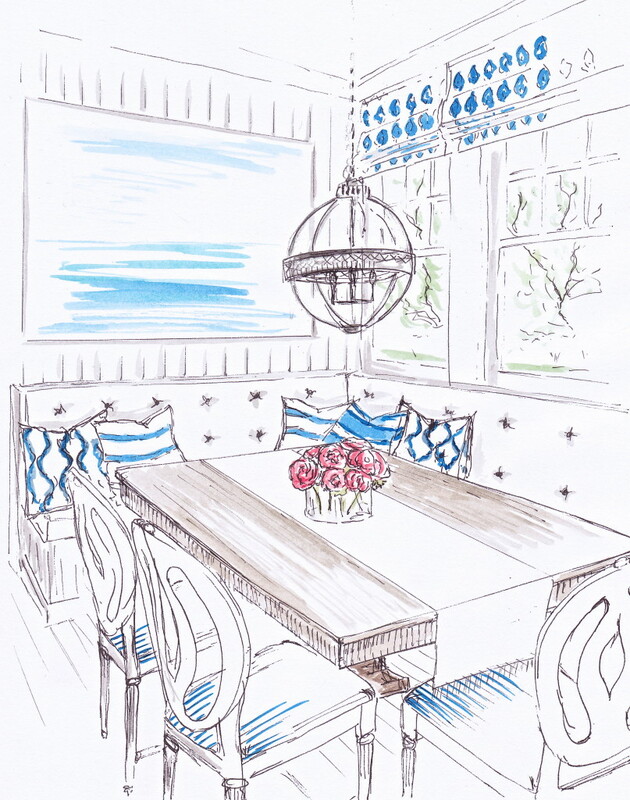 The layout of a dining space with a built-in banquette is to me just the most welcoming and convivial layout. Doesn’t it just invite you to sit and stay awhile?